The field of mechatronics using piezoelectric and electrostrictive materials is growing rapidly with applications in many areas, including MEMS, adaptive optics, and adaptive structures. 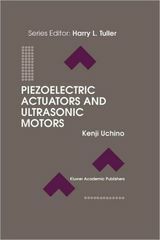 This book provides in-depth coverage of the theoretical background of piezoelectric and electrostrictive actuators, practical materials, device designs, drive/control techniques, typical applications, and future trends in the field. Industry engineers and academic researchers in this field will find this book an invaluable source of pertinent scientific information, practical details, and references. In the classroom, this book may be used for graduatel level courses on ceramic actuators.